The city of Myrtle Beach has done away with the law requiring requiring pet owners to have a license for their pet. This annual fee was considered unnecessary. Pet owners must show proof of vaccination and are required to wear a collar with proper identification. On the beach: Open liquor or beer prohibited, including streets, sidewalks and beach area. The Grand Strand has ZERO tolerance for drugs and related crimes. Owners are responsible for removing pet waist from the beach and public property at all times. Nearly 800! That's the number of cameras overlooking the streets, intersections and parks in the city. Horseback riding Horseback riding on the beach is allowed only with a properly approved special event permit. The previous exemption for horses until the end of February does not apply. Special Events Application or Facility Use Permit. Click the links above to access the PDF forms. Or contact Construction Services at 918-1111 for Special Events permits. For Facility Use permits, call 918-1008 or 918-1808. On the Boardwalk - dogs and bicycles May 1 through Labor Day pets are allowed on the beach only before 10:00 a.m. and after 5:00 p.m. At all times, pets must be on a leash of 7 feet or shorter, and owners are properly dispose of any droppings. Bicycles also must observe the “before 10:00 a.m. and after 5 p.m.” rule for the beach. However, on the Boardwalk, pets and bicycles are allowed only in the morning, from 5:00 to 10:00 a.m., during the day through Labor Day, pets must be on a leash and their droppings must be picked up. The City of Myrtle Beach has nearly 800 surveillance cameras at major intersections and locations around the city including parks and facilities. Don't even THINK about breaking the law! Here are photos I took in October, 2016. These are current beach laws. Beach Laws 1 Beach Laws 2 Dogs in public must be on a leash at all times. Dogs are not allowed on the beach between 9 a.m.-5 p.m. May 15 - Sept. 15. Surfside Beach laws: Riding horses on the beach is not allowed. No tents, cabanas or other items left overnight. They will be considered abandoned and may be removed. Dogs must be leashed from 9 a.m. to 7 p.m. Dogs that are not leashed during these hours must be under voice control and owner must be able to demonstrate voice contril of their dog to a law enforcement officer if asked. 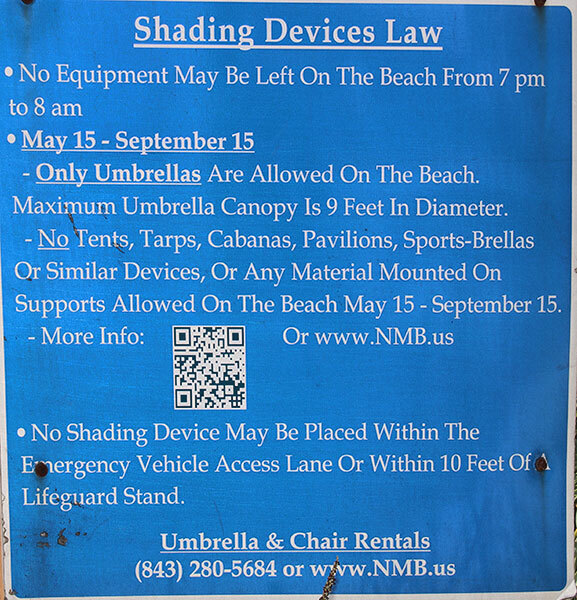 Shading devices: circular umbrellas with a circular shade no greater than 7 feet six inches (7’6”) in diameter, are not permitted on the beach (year-round). This included, but is not limited to - tents, tarps, cabanas, pavilions, sports-umbrellas, or similar devices. An umbrella is defined as a collapsible circular shade consisting of a natural or synthetic fabric shade stretched over hinged ribs, radiating from a center pole, grounding lines or ropes. Horry County leaders changed the business license law. In a effort to cut out “problem businesses” in Horry County, change the way businesses apply for a business license. Here is the current information regarding business licenses in the city of Myrtle Beach. Horseback riding on the beach is not allowed Nov.1 until the end of Feb. each year, subject to the rules listed below. No permit needed. 2. Riding across sand dunes in prohibited. 4. There will be no parking of horse trailers on the public right-of-ways. 5. All riders are asked to clean up after their horses landward of the mean tide line. There is a $25.00 per horse fee. It is illegal to use any equipment in any manner that could endanger bathers, swimmers, surfers, or others in the water. Sailboats, motorboats, and Jet skis (or other personal watercraft) must remain at least 400 feet from the shoreline and 500 feet away from any fishing pier, with the exception of entering or exiting the ocean. Sailboard, motor boats and jet skis may not be launched or retrieved within 50 yards of a lifeguard stand, unless otherwise designated. Motorized watercraft may bot be launched from the beach from 9 a.m.-5 p.m. May 15-Sept. 15. Jet skis, catamarans, sailboats, or other watercraft may not operate within 100 yards of the shoreline or within 50 yards of any swimmer. Surfing is not allowed from 9 a.m.-4 p.m. May 15-Sept. 15, except in these designated areas: Cherry Grove Pier 23th Ave.S., 28th Ave. S., 38th Ave. S., and 6th Ave, N.
Access to the beach for motorized or non-motorized boats or jet skis is limited to the designated ramp at 4th Ave. S. No motorized vehicle may be used to transport watercraft across the ramp. All aquatic activity within 150 feet of a pier is illegal. Boats and jet skis (or other personal watercraft) may not be operated within 100 yards of shore April 15-Sept. 15; however, Jet Skis may be launched and returned to the beach on a perpendicular manner. Boats and jet skies may not be launched from the beach or returned to the beach April 15-Sept. 15 in the area from 29th Ave. S. to 31st Ave. N., and from 69th Ave. N. to 77th Ave. N.
Surfing and kayaking are restricted to certain areas April 5-Sept. 15. During those dates, from 9 a.m.-5 p.m., surfing and kayaking are allowed only in these areas: from 29th Ave. S. to the southern city limits at Springmaid Pier (Doubletree Resort), from 39th Ave. N. to 47th Ave. N., from 62nd Ave. N. to 68th Ave. N., and from 82nd Ave. N. to the northern city limits. The area from the south side of 8th Ave. N. to the north end of the public boardwalk may be used for surfing or kayaking Oct. 1-April 15. Kayaks launched and returned to the beach on a course perpendicular to the beach for use out of the surf zone, not subject to the previously mentioned time and area restrictions. It is illegal to build a fire or use a propane-fired grill or any other cooker on the beach. It is unlawful for any person to drive or operate any motor vehicle on the beach or within puclic marsh areas. Discharging of fireworks is illegal within the municipalities along the Grand Strand. Establishments that sell fireworks within Horry County are required to post rules and regulations regarding fireworks in a conspicuous location. Golf Cart Laws Myrtle Beach bike paths are for bikes, not golf carts or other motorized vehicles. Violations may be in the $200.+ range. New information about golf cart crossing Hwy. 17 Bus. 8/23/18 - Residents living in or near The Market Common District For those who want to take a golf cart drive o the state-approved golf cart crossing on Kings Highway, here’s how. You can legally access this crossing to the State Park by taking Mallard Lake Drive to the Barc Parc South entrance road, then following that road around to the shopping center. The internal parking lot there exits at the signalized intersection on Kings Highway, where the state has installed the marked golf cart path leading to the Myrtle Beach Stte Park. Disposing of litter or solid waste is illegal and private property and in S.C. waters. Cigarette butts are considered litter. The Court may impose fines, assign you to clean-up hours, or may just send you to jail. MOPEDS If you are 15, you may apply for an operator's *(or Class G) license by taking the vision and knowledge test at any SCDMV branch. South Carolina does not require a skills test for moped applicants. You must have a valid driver's license or moped license to drive a moped. Additionally, your moped must be registered. If you are 16 or older with a moped license, you may drive a Moped alone at any time. Read more Moped laws here. Open containers of beer, wine, or liquor are prohibited ib vehicles. Driving under the influence of drugs or alcohol is illegal; penalties include a fine of more than $200 and loss of driver's license in South Carolina and the driver's home state. Vehicle headlights must be on your windshield wipers due to rain, fog or other unsafe conditions. Motorcycles are required to use headlights all the time. Children 17 or younger in a moving vehicle must be restrained at all times by means appropriate for child's age and seating location (National Highway Traffic Safety Administration). Cruising in Myrtle Beach. Cruising is regulated by the Myrtle Beach Police Department, between 3rd Ave. S. and 21st Ave. N. on Ocean Boulevard from 2 a.m.-6 a.m. March 1- October 1. 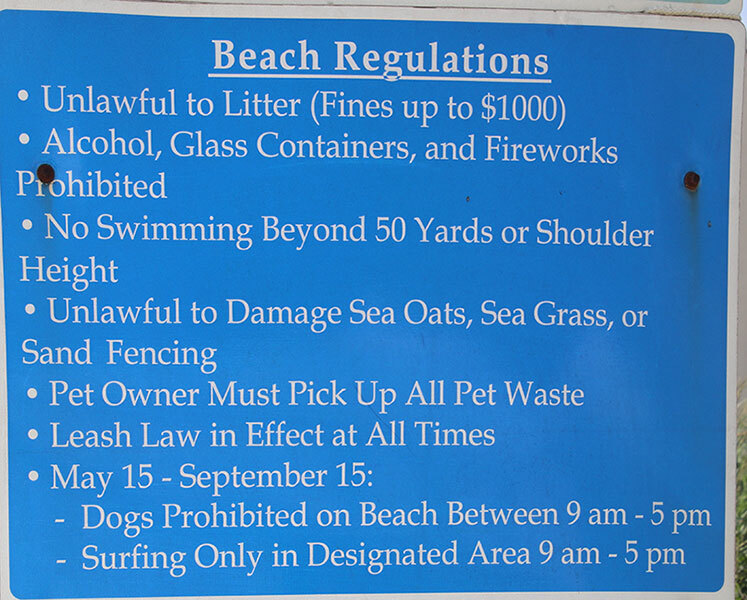 It is illegal to cut, break, or in any way destroy sea oats, beach grass, or sand fencing. Sleeping on the beach or on any public access is not allowed between 9 p.m. and sunrise. Soliciting on the beach is illegal. Swimming is not permitted beyond 50 ft. from the beach or over shoulder depth, unless otherwise stated by lifeguard. Jumping or diving from any pier is prohibited. Swimming within 50 yards of a pier is prohibited. Only canvas rafts can be used in the ocean, and rafts must have safety ropes. Swimwear is subject to the city odinances in Myrtle Beach, North Myrtle Bech and Surfside Beach. It is illegal for anyone to wear a thong bathing suit. Thanks for this information: Myrtle Beach Area Chamber of Commerce. and the City of Myrtle Beach.